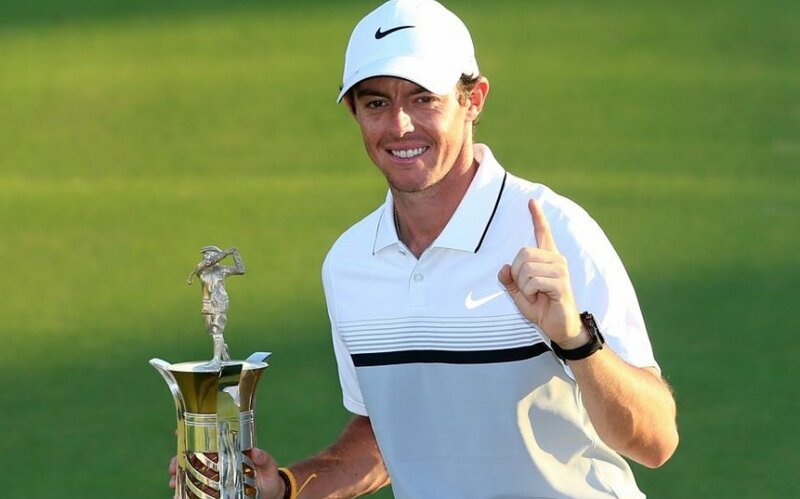 Rory McIlroy, who was sidelined for much of 2015 with an ankle injury, stormed back at the European Tour Championship to capture both the tournament and the season long Race to Dubai money title. With the victory and a fresh new attitude, McIlroy seems poised to rejoin the other two members of the Big 3 – Jordan Spieth and Jason Day – neither of whom shows any sign of slowing down. The 2015 PGA Tour season did not go as swimmingly as Rory McIlroy likely expected. After rupturing a tendon in his ankle during a friendly soccer match with friends in July, the Northern Irishman was sidelined for over a month. When he finally returned from injury, McIlroy had decent stretches and even finished in a tie for 4th at the BMW Championship. However, it was pretty clear that most, if not all, of the momentum that the 2012 and 2014 PGA Tour Player of the Year recipient had accrued before suffering the injury had been lost. Not surprisingly, it did not take long for both Jordan Spieth and Jason Day to pass McIlroy in the Official World Golf Rankings. Day finished his 2015 season on fire, racking up four victories in just under two months down the stretch. In fact, Day was so consistent over the last three months of the PGA Tour season that his worst result was a tie for 12th at the Deutsche Bank Championship. There is really no need to recount Spieth’s accolades from this past season unless you were living under a rock, but here are a few notable stats. The Texan won 5 tournaments, including the year’s first two majors, and finished in the Top 10 in 15 of the 25 tournaments he entered. En route to winning the FedEx Cup at only 22 years of age, Spieth also earned more than $12 million in tournament cheques as well as the 2015 Player of the Year honours. Prior to the injury, McIlroy had always leaned on his natural ability to fend off entire fields of competitors. However, with Day and Spieth firing on all cylinders, and showing no signs of slowing down, things were certainly going to be different for the Northern Irishman. McIlroy was not going to be able to waltz back out there and start collecting wins. It was going to take a lot of hard work, dedication and focus to reclaim his spot atop golf’s pantheon. Fast forward to two weeks ago at the DP World Tour Championship — the final event of the European Tour’s Race to Dubai — where McIlroy came away with his first victory in six months. In the process, the Northern Irishman demonstrated not only some of the mojo that fuelled him to two majors in 2014, but also the type of determination that critics have been accusing McIlroy of lacking since the onset of his career. Despite an impressive amount of natural talent, McIlroy has never really displayed the same hunger for excellence that has acted as the motivating force for Spieth and Day. McIlroy has always seemed content to win a few majors here and there, but has never shown the personal drive for greatness that Spieth, Day, and to a larger extent, Tiger Woods have always emanated. In an interview with Golf Digest last year, Jack Nicklaus said that, “Rory is good enough to achieve whatever he wants in his career, but I don’t know what Rory really wants.” Nicklaus went on to describe how in his experience, priorities shift as one matures and that all players eventually need to find a balance between “ambition and sanity” and that McIlroy will eventually find his. Well, it appears from McIlroy’s comments following his recent victory in Dubai that the 26-year-old is finally coming to terms with this notion. Clearly, McIlroy is maturing. It looks like he has reprioritized what is most important in his life and is beginning to settle down. If the rumour that McIlroy plans to propose to his American girlfriend Erica Stoll has any legitimacy, — as the Northern Irishman’s friends have been suggesting to the media — then we might actually be seeing the first signs of a changed and more ambitious Rory McIlroy. Truthfully, McIlroy’s epiphany could not have come at a more pivotal time, as Jordan Spieth appears to be getting better every month. This past week at the Australian Open, Spieth did not play anywhere close to his best golf and still came in second place overall, finishing only one stroke behind winner Matt Jones. In fact, Spieth hit only 18 of the final 36 greens in regulation and started his final round 3-over par thru six holes, falling five shots back of Jones to begin the day. However, even when the Texan plays poorly — for his standards — Spieth is still heads and shoulders above the rest of the field. To boot, Spieth has now only played in two tournaments since the Presidents Cup in early October. With all of this time off — admittedly, the most downtime he has had between tournaments since he was “12 or 13” — the 22-year-old is likely feeling the effects of a little bit of rust on his game. It is a certainty that said rust will not be there for very long. The Texan, who is becoming more of a perfectionist with each victory, is poised for yet another monstrous, record-breaking season in 2016. Spieth and Day have created a new standard of weekly contention on the PGA Tour. When these guys are playing well, they are in the hunt every single week! McIlroy has shown flashes over his career of being able to maintain that level of consistency and it will be interesting to see whether the Northern Irishman can take his game to the next level. Either way, the 2016 season is going to be an exciting three-horse race with golf fans everywhere glued to their couches.